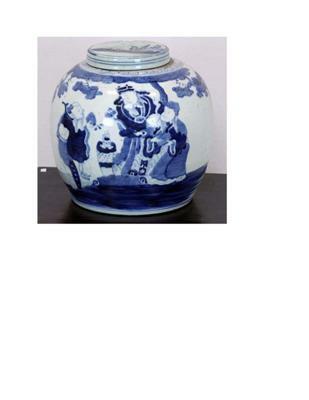 I apologize as this is the only picture that I have of this ginger jar as I am trying to determine if I should purchase. I can see that the neck is not glazed but have not seen the bottom, etc., only this picture. Is there anyway that you can tell if this is an older piece such as Qing or does it appear newer? Thank you for your expertise and time. Thank you for the advise. I will invest elsewhere. The picture is much too small to see anything clearly. You mention that the collar is not glazed, but there exist new items (fakes) also that have an unglazed neck. Mostly they will rub on something to make it dirty and look old. The blue color in this picture looks as if it were a chemical pigment that was used only from the late Qing dynasty onwards,and the 20th century. That is, the shape looks more 18th century while the pigment appears to be from the late 19th or 20th century.